Russia, Yamal-Nenets Autonomous Okrug, Tyumen Oblast. The Yuzhno-Russkoye oil and gas field. The Yuzhno-Russkoye field is a Russian oil and gas field located in the Krasnoselkupsky District, Yamal-Nenets Autonomous Okrug, Tyumen Oblast. The proven gas reserves of Yuzhno-Russkoye are 805.3 bcm (billion cubic meters) and estimated reserves are more than 1000 bcm of natural gas.The planned capacity of Yuzhno-Russkoye field is about 25 bcm of gas per year. 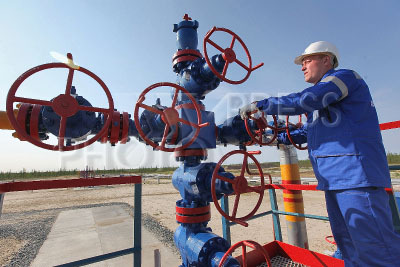 Currently there are 26 gas wells in operation producing 15 million cubic meters of natural gas per day. It is designated to become the main natural gas supply for the Nord Stream pipeline. Pictured: gas holes hub .